despite the recent transfer of manufacturing operations. IN spite of the fact that Durant Motors, Inc., transferred its manufacturing operations from Elizabeth, N. J., to an enlarged plant in Lansing, Mich., within the last few months, its production for the first quarter showed a gain over the first quarter of 1928 from 20,976 to 21,075. Shipment of the 66 and 70 models are beginning this week, and this will add f further to the production schedule. 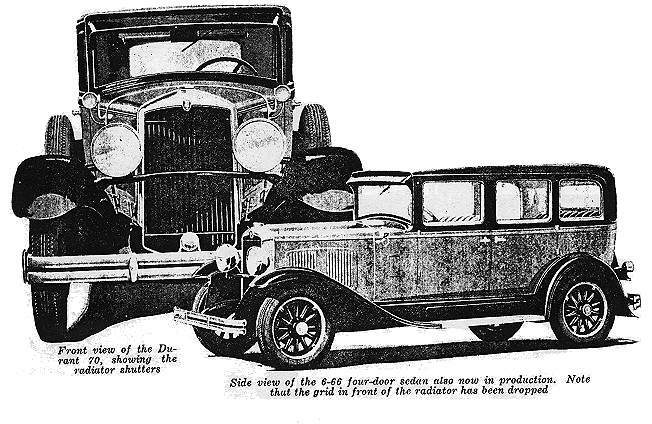 While the majority of Durant cars turned out in 1928 were four cylinder models, during the first quarter of the current year the domestic demand has been mainly for sixes, while among the cars exported the fours continue to lead. Of the passenger cars which constitute the present Durant line, the 6-66 at $895 to $975 and the 4-40 at $595 to $696 are already well known. The 6-60, ranging from $685 to $760, and the 6-70, at $1,195 to $1,285, were described in these columns at the time of the New York Show, although not then in production. Since show time, however, a number of changes have gone into effect, including some minor price revisions. Thus the 6-60 sport roadster is now priced at $685 instead of $650; and the Cabriolet and sedan models on this chassis now list at $750 instead of at $745. De luxe models on the 6-66 line are now $130 higher than the standard models, instead of $115 higher, as formerly. The cost for de luxe equipment on the 6-70 models is now $140, also an increase over the former price of $125. In the bodies, a number of minor changes have been made to improve the appearance, including the dropping of the grid in front of the radiator core, and the adoption of thermostatically controlled shutters on the 6-70. Mechanically the most important change is in the 6-70 powerplant, which has a 5/8 in. longer stroke than when first announced, its bore and stroke now being 33A by 45/8 in. This increase in piston displacement of 33 cu. in. to 248 cu. in. resulted in an increase of 5 hp. in maximum output, the engine now developing 70 hp. at 3000 r.p.m. A slight increase in the size of the valves both of which now have head diameters of 15/8 in. also contributed to the increase in engine power. In the chassis there has been a slight lengthening of both front and rear springs on the 66 and 70, front springs on both now being 36 in., and rear springs 54 in. long. The Durant four-speed transmission continues to be the leading feature of the three higher priced chassis models. This internal gear unit is especially notable for its ease of shifting made possible by the shortening of every two out of three teeth of the sliding gear, thus giving what amounts to a combination tooth and dog clutch engagement. With this engagement, gears can be shifted without declutching if desired up to considerable road speeds, while a downward shift from fourth to third can be made even at 60 m.p.h. in the regular way, but without double clutching.